If You’re Not Following These 3 Basic Festival Rules, Nothing Else Will Matter. Whenever I talk to filmmakers who are just starting out on the festival circuit, I usually get a lot of questions about specific circumstances they’re facing, or requests for lists of my favorite festivals. As is natural for anyone who is learning new things and searching for solutions to interesting problems, these folks are looking for shortcuts. If there’s a tool, tip, or list we can jot down and file away for future use, we’ll do it, because it makes us feel more empowered – even if we know deep down we’ll never get around to acting on the information. Things usually get quiet after that. Here’s my list of festival fundamentals. They’re not as much fun as a list of favorite tools or instant tricks, but if you follow them, I think they’ll serve you well. 1. Make sure you’ve made the best film you can BEFORE you start submitting to festivals. This sounds obvious (I said it would! ), but every year I field several dozen emails from filmmakers who want to know if the festival I work for will accept an “updated” version of their film. Sometimes the changes consist of sweetened sound or color correction, but sometimes the film has been completely revamped because the filmmaker finally realized the perfect editing changes to fix the third act. If you knew the third act wasn’t quite right, why did you start sending the film to festivals? Impatience is usually the answer to questions like that. We want so much to get to the next step in the process, to get the gratification of an audience’s appreciation, that we rush something out before it’s ready. Yes, it requires the patience to really finish a film and a critical eye on your own work. But if you haven’t made a picture that is at least remarkable, an entire mountain of advice won’t give you a better festival run. How do you tell if you’ve made a film that will meet the minimum standards for festival acceptance? Chapter 1 of Film Festival Secrets is devoted to this topic, but the most important test is feedback from people who don’t know you (and therefore, don’t mind hurting your feelings by being honest). Test screenings with a live audience - just like those Hollywood testimonial commercials, but you’re looking for negative comments. These require some effort to organize, but probably have the best payoff. You’ll need a venue, projection & sound equipment, and an audience, all of which you can probably get on the cheap with the right amount of favor-trading and begging. Watching an audience respond to your film will be worth it (no festival acceptance necessary! ), and getting their instant feedback is nice too. If you’re not sure what questions you should be asking your audience, there’s a free download of the audience survey that I use with clients right here. Online test screenings with surveys - not as personal, but still effective. It will also be easier to get large numbers of people since they can participate on their own time. A password-protected Vimeo screener or similar will keep your film limited to the test audience, and you can use survey software like SurveyGizmo, Wufoo, or Google Forms to collect the answers. Limited YouTube release - this is similar to online test screenings, but throws caution to the wind a bit. Upload the film to YouTube, make it public, and ask friends to share it. A viable festival candidate is a film that begs to be shared, so you should see your views grow (even modestly) over the next few weeks. If the views peter out after a few days, your film might be in need of a retool. If your film is so insanely great that you’re getting hundreds or thousands of views a day in a short time, congratulations! You can either let it go viral or yank it from public view so you can submit the film to festivals with confidence. Be careful, though - once a film is out there on the web it can be difficult to control what happens after that. Many festivals frown on films that are already available to the public online, so if you intend to send your picture to festivals, you’ll need to withdraw it from YouTube, at least for the duration. Festivals that offer feedback - these are rare beasts indeed. Most festivals don’t offer any feedback on submitted films, for reasons you can read about elsewhere. (DC Shorts is the only one I can think of right now.) If you can find a festival programmer willing to take a look at your film unofficially (because you volunteered at the festival or because she’s just a lovely person) or as part of the festival’s official submissions process, take her up on it. Once you’ve collected feedback, approach it with an open mind but don’t let every little bit of criticism bother you. The important thing is to look for showstoppers – something about the film’s editing or story that confuses the audience or causes them to lose interest in how the story ends. What’s obvious to you may not be obvious to the audience, and you have to fix that, no matter what. Hopefully you caught those problems earlier in the process, because fixing them after the fact can be expensive or simply impractical. As for smaller problems, I encourage you only to pay attention to them if you notice that a large segment of the audience responds in a negative way to some minor aspect of the film. One person who confuses two actresses for one another and loses the plot as a result – that’s an anomaly. Ten people who make the same mistake in the same screening? That’s a problem that needs fixing. Just think, it’s a problem you probably wouldn’t have known about if you hadn’t gotten objective feedback. 2. To get professional treatment, act like a professional. Once a festival’s programming team has narrowed the field down to the films they’d liketo play, they have to further cull their selections to the films they have time to include. This can be particuarly tough at festivals that only last a few days. One thing you can control is the level of professionalism you bring to the submissions process. When a festival selects a film for inclusion, a kind of business partnership is formed. Unable to promote each and every film screening to the fullest, most festivals rely on filmmakers to work on behalf of their films to help fill seats. It’s not entirely up to you to fill your screening, of course. The festival intends to devote marketing attention to your film, or they wouldn’t have picked it. But the more the festival team perceives you as the kind of person who is willing and able to promote your film yourself, the more likely it is to select your work in the first place. Before you can taste the food, you get clues about the restaurant in other ways: what’s the decor like? Is it clean? Who else is eating there? All of these things can tell you a lot about the dining experience you’re about to have, but there are plenty of restaurants that might fail these tests and still serve an amazing plate of food. What about a restaurant that has great food but mistreats its customers, or fails a health department inspection? Suddenly the fantastic food doesn’t seem worth the risk. Though you might be willing to sacrifice on some aspects for the sake of a great meal, ideally you want the best of both worlds. The same is true of festival programming. If a film is truly spellbinding and the staffers at the festival know it will pack the house, they might disregard the fact that you have practically zero presence on the web for your film or you take a week to return their phone calls. But if there’s another film they like just as much with a more professional production team behind it, they might just go in that direction instead. I’ve only seen festivals “uninvite” a handful of films in my festival career. Each time it was because the film was good, but not good enough for the festival staff to put up with the jerks who made it. It’s rare but it does happen. Don’t let it happen to you. There are other indicators, of course, but those are the big ones for me. Notice that I didn’t even mention quality of filmmaking in that list. There are plenty of inept filmmakers who can behave professionally, just as there are plenty of brilliant filmmakers who act like the world owes them something. It’s when the two forces combine that things start to get interesting. A truly great film can overcome the shortcomings its creator might have. The filmmakers who seem to do best on the festival circuit and in life, however, are those who inspire people to like them even more than their work. Instead, consider this: most festivals have, at the very least, three deadlines. At the early deadline, fees are at their lowest – typically half of what festivals charge at the late deadline. By any sane logic, most filmmakers would submit on the early deadline every time. They could submit to twice as many festivals and effectively double the number of chances they have to be accepted at festivals. So why do filmmakers routinely spend exorbitant sums on late deadline entry fees and overnight shipping? Constant messaging from festival submissions platforms touting vanishing deadline opportunities doesn’t help, but unless your film is of an extremely time-sensitive nature, the decision to submit on a late deadline is almost always an emotional one. If you’re seriously considering a festival with only its late deadline left open, there’s probably a little voice in the back of your head, telling you that this is a festival where your film could have a really good chance. It’s worth it, says the little voice. Their audience sounds perfect for our film and if we don’t do it now we’re going to miss out and next year they won’t want the film at all. Tell the voice to shut up. Submitting on a late deadline is a bad idea for a number of reasons, but paying more for no greater chance that your film will get into the festival should be all the reason you need. So: what to do about it? Do not click the “submit” button on any late deadline windows you might have open. Step away from the computer. Refer to Tip #1, and make sure you’ve made the best movie you can. Create a submissions strategy for your film. This is covered in-depth in Film Festival Secrets chapter 2. You can get a jump start on it with this article on defining your film and yourself. As part of that submissions strategy, commit to the idea of only sending your film to festivals whose early deadlines are open. Take into consideration the fact that every festival is an annual event, and that films often spend a year or more touring the circuit. If a festival’s early deadline is past, you can catch it in the following year (probably more like 6 months when the early deadline opens again) and you’ll probably have a better chance of getting in, especially if your film has proven itself at other festivals in the interim. You may hear from other filmmakers that waiting so long to submit will hurt your chances of getting into that festival in the following year, either because your film will be regarded as “old” or played out, or whatever. Ignore this advice. Whatever disadvantage your film may have by waiting until the following year’s event to submit to a particular festival, that’s nothing compared to the disadvantage you inflict upon your festival run by missing out on the festival to which you might have submitted – but couldn’t, because you spent too much on late entry fees. The wheels of festival programming turn slowly, and the clock doesn’t start ticking on your film until you first start submitting it to festivals. So if you have to sit on your picture for a few months until the next early calls for entry come around on your preferred festivals, sit on it. Go make another film, or do some more test screenings. Almost anything is preferable to spending more than you absolutely have to on festival submissions. So there they are, the three obvious-sounding but critical concepts that can practically guarantee a happier festival run for your film. Let me know about your own experiences with these ideas; drop me a line at chris@filmfestivalsecrets.com. 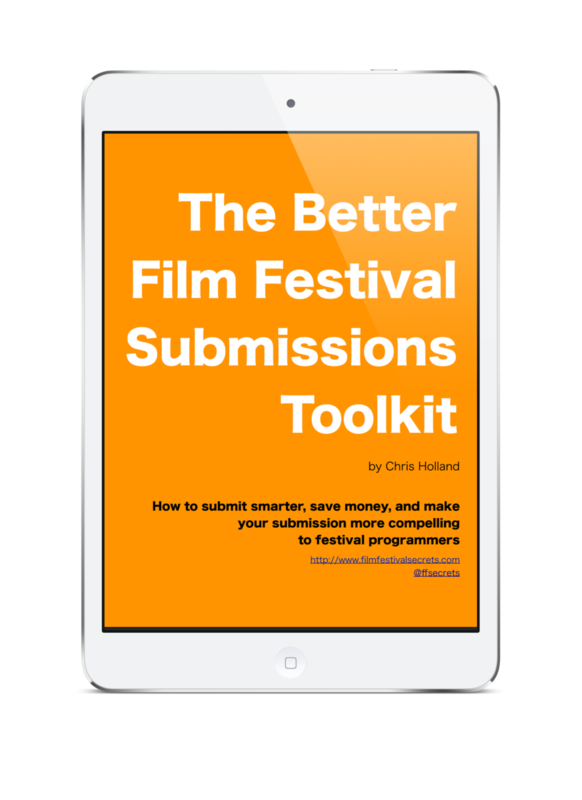 Oh, and if you’re looking for that list of quick and dirty tools & tips, check out the Better Film Festival Submissions Toolkit – it has a bunch of practical, quick, and actionable ideas that can whip your submission package into shape in about a week. Best of all, you can download it for free or pay a few dollars if you’re feeling generous.